Laurel Coffee Table. Italian coffee table. Custom cocktail table. The design of the Laurel Coffee Table was influenced by the mythology of ancient Greece. Laurel leaves surrounded the temple of Apollo to cleanse the soul before entering. Associated with purification, it was seen as a plant with powers of immortality. The common belief was that laurel awakened awareness and past life memories, stimulated psychic awareness, improved health, and gave the power of divination. Laurel leaves were often placed under pillows at night to gain inspiration through dreams, and its intoxicating properties were associated with prophetic and poetic inspiration. The Laurel Coffee Table is entirely handmade with painstaking attention to detail. Molten metal is poured into a mold to create a raw casting. After hours of careful filing and grinding the casting is made ready to receive its hand-applied multi-layer finish. Robust metal construction allows the Laurel Coffee Table base to support heavy tops such as thick glass, stone, or wood. 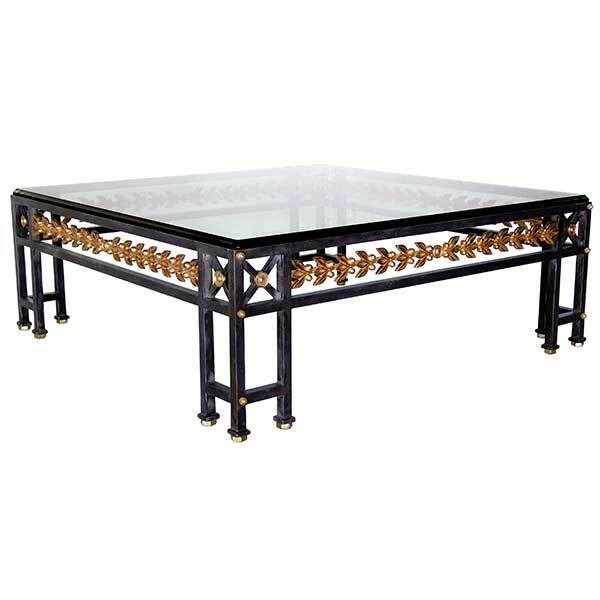 This exquisite piece makes an exceptional cocktail table for upscale eclectic interiors. Twelve polished bronze glides are provided which also serve as levelers – a useful feature when the floor is uneven. The coffee table base is offered in a variety of finishes and accents. Custom sizing is available. Designed by Shah Gilani, ASFD.